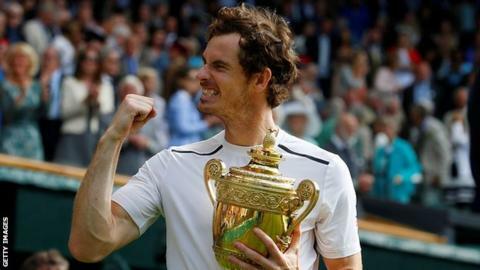 Two-time Wimbledon champion Andy Murray has been named as the official starter of the London Marathon on 28 April. He follows in the footsteps of the Queen, who started it in 2018, while the Duke and Duchess of Cambridge and Prince Harry did the honours in 2017. Scot Murray - currently rehabilitating following hip surgery - said it was an "honour" to be asked. "It's such an amazing race that means so much to so many people," the 31-year-old added. "It raises millions each year for charity and helps inspire people to get active. I have nothing but admiration for everyone who runs - I may even run it myself one day." Murray - also a double Olympic champion - was in attendance at the 2014 London Marathon when his wife, Kim, took part. Event director Hugh Brasher said: "Sir Andy Murray is one of Britain's greatest sporting superstars and it is so fitting that he will be the official starter for one of the country's greatest sporting events and the world's greatest marathon. "Andy is renowned as one of the toughest and most competitive sportsmen on the planet and someone who does not recognise barriers in sport."